Drones are the toys of the future, except that the future has arrived. These small, remote controlled aerial devices resemble alien aircraft with their circular or dome-shaped structure and are becoming increasingly popular with the public. Unfortunately, these drones can be instruments of serious or even deadly force in the hands of untrained amateur operators. Drones first came to the public’s attention as a military weapon used by the US in Afghanistan to surreptitiously photograph and then deliver missiles or other lethal force to certain targets with pinpoint accuracy. It is a less costly method of delivering its deadly message and without the need for manned aircraft. On the domestic side, these devices are a hit. Many users equip the drones with cameras to take spectacular photographs from hundreds of feet up or even higher, depending on the sophistication of the drone. Some incidents of drones encountering commercial aircraft have been reported that have jeopardized their safety, however, since a collision could damage and cause loss of control of the airliner. Taking photographs at particular events is a popular use of drones. At a wedding event in New Hampshire recently, the groom decided to use a drone to take photos of the wedding. However, things went awry as the drone went out of control and struck two guests, apparently causing them facial injuries, a concussion and a fractured nose. The two guests have filed an injury lawsuit against the groom and the proprietors of the venue where the wedding was held. Like any other accident caused by the negligent or wrongful conduct of another person or entity, you can make an injury claim if hit by a drone. These devices are under the control of the operator who has a duty to exercise reasonable care when using it, just like any motorist of a motor vehicle. Compounding the issue of what constitutes reasonable care in this context is that these devices demand some level of expertise in their use that cannot be verified, unlike a driver’s license where you do have to pass written and behind-the-wheel tests. There are currently no federal laws or regulations regarding use of personal drones, though many municipalities have banned them from invading commercial air space. Also, these devices can reach speeds of 140 miles per hour and attain heights of over 5000 feet. In an incident in New Zealand last year, a personal drone was reported to have nearly collided with a commercial aircraft at 1800 meters, or nearly 6000 feet. Even at lower speeds and heights, these devices can seriously injure someone in a collision. The accident at the New Hampshire wedding highlights the dangers of these devices in the hands of persons who are not required to have any training or certification. If hit by a drone and injured, you can bring an injury claim against the operator for failing to use due care in its operation and possibly against the drone manufacturer. There may be liability against the landowner, if different, and if he or she knew or should have known about drone activity. Most devices of this level of sophistication likely contain instructions on their use along with warnings, but the instructions must be adequate and accurate and the warnings sufficient and conspicuous enough regarding possible accidents and injury to others. Also, if the drone itself contained some defect in its design or manufacture that makes it difficult to control or can result in a loss of control, then that is another avenue of liability to pursue along product liability principles. In the New Hampshire wedding accident, the venue’s owners have asserted they are not liable since the groom brought the drone to the event despite being warned and was again told to stop using it during the event. The groom is likely liable for either negligently operating it or allowing someone else to do so who was negligent. Some commentators have raised the possibility that a defendant could be held strictly liable, much like a dog owner whose pet bit or attacked someone. In these cases, all the claimant has to do is prove the injury was caused by the drone and that the defendant owned the device. Any person who operated the drone with the owner’s consent would also be liable. As far as collecting an award following a judgment or money verdict, you may have to go after the done operator personally. It is doubtful that most homeowner’s or renter’s liability policy would cover injuries from a drone. 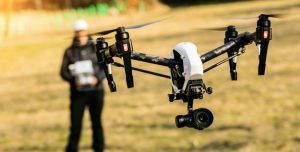 If contemplating operating such devices, consumers should explore liability insurance that would cover accidents when using a personal drone, since such policies are available. In any event, retaining a drone lawyer if you or a loved one was hit by a drone is essential since these cases raise many issues not found in a typical injury claim. Drone injury claims demand that you retain the services of a drone lawyer. Attorney Neil Burns & Roshan Jain of Burns & Jain have represented thousands of clients who have sustained injuries in all types of accidents. Having an attorney who understands or appreciates new technology and how these represent new challenges within existing laws is essential if you wish to collect the compensation your injury claim deserves. Call their office today for a free assessment of your injury claim: 617-227-7423.